After last years mildly disappointing foray into the world of quinces, I decided to brave another go. Especially as I was gifted a bag of freshly picked quinces via a friend. I am glad I gave them another chance because this year I think I finally got what quinces are about. 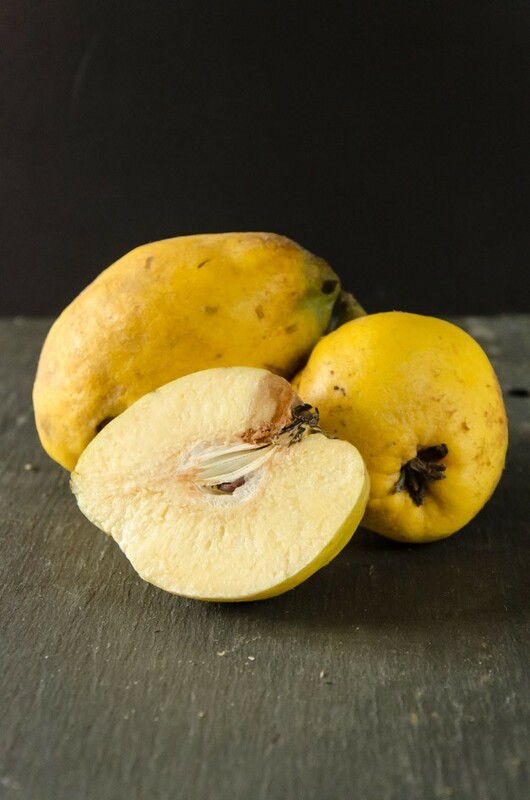 Quinces are like a cross between an apple and a pear but with an amazing floral fragrance. Larger than a typical pear, but with a similar shape, they have a bright yellow lumpy skin and are rock hard to cut with a grainy texture. Unique is what I would call them. They are an old-fashioned fruit and were once considered an aphrodisiac and sweatmeats made of quince were served at the end of tudor banquets to help with digestion (and quite possibly the former mentioned effect too). I think what is different about this year’s quinces are that I left them in the fruit bowl for a couple of weeks; they developed some brown soft spots but their famous perfume was immediately apparent. 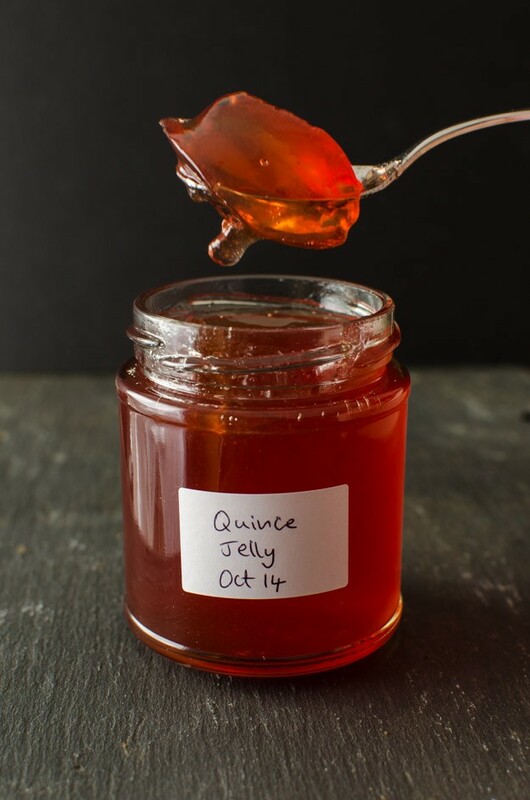 I was a little short of time once the quinces were ready so I decided to try making quince jelly as I can make jam/jelly while listening to lectures for my course; multi-tasking! I was really surprised by the beautiful coral pink jelly that emerged. It wasn’t this colour until being boiled with the sugar. And I cannot stop eating the jelly. Mainly on its own straight from the jar, but also with cheese and real ham or as a filling for a sponge with whipped cream. Now I understand the special-ness of quinces, some recipes I need to try in the future include a flavoured liqueur called ratafia, poached with spices and adding them to apples in pies and crumbles. There are also some intriguing Persian recipes out there too. 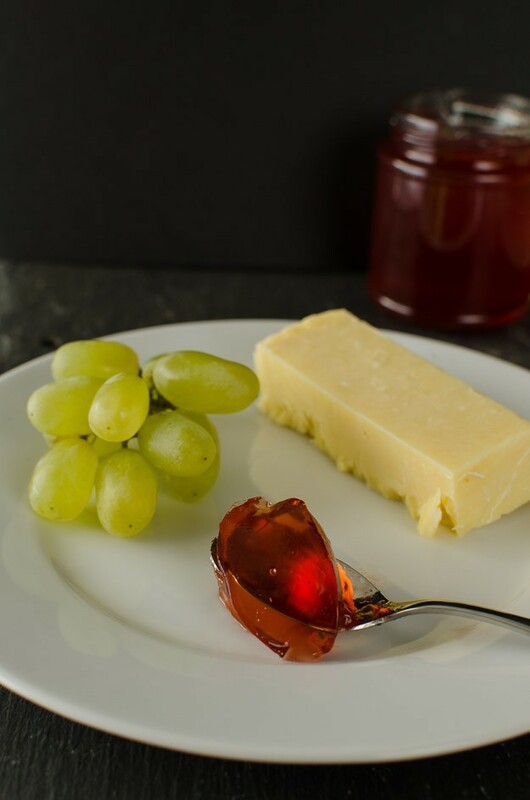 For more inspiration see historic food and some of the recipes on British Larder such as quince curd, chutney and crumbles. Wash the quinces, rub off the soft down on their skins if present and remove bruised or blemished parts. Roughly chop the whole quinces, skin and cores, and place in a large pan with the lemon rind. Add enough to water to just come to the top of the quinces. Simmer gently for an hour or so until very soft. Stir in the lemon juice. Strain the whole lot in a jelly bag (sterilised with boiling water) overnight. I squeeze my jelly bags a little to get more juice out and I do not find it affects the clarity of the the final product (if you read about making jellys then squeezing the bag is supposed to be forbidden as it gives a cloudy jelly). Measure the juice and pour into a clean pan. Add 450g of granulated sugar for every 600ml of juice. Heat gently, stirring frequently until the sugar is dissolved. The bring to the boil and boil vigorously until setting point is reached – I found it only took about 10 minutes. Skim, pot into hot sterilised jars and seal.